Zach Bogosian, Steven Stamkos, Drew Doughty and Alex Pietrangelo made the OHL proud on Friday night, as the quartet was selected 1-4 in the 2008 NHL Entry Draft. OTTAWA-- The OHL's big night -- On the first day of the 2008 NHL Entry Draft, the O came first, before the Q and the W -- and we're not just talking alphabetically. Seven of the top 10 selections in Friday’s first round skated in the Ontario Hockey League last season, and in all, 11 of the 30 players selected in the first round came out of the OHL. By comparison, nine skaters came from the Western Hockey League, including four straight from picks from No. 11 to No. 14. The Quebec Major Junior Hockey League brought up the rear, as it did not have a single player selected in the first round. The edge in numbers becomes a point of pride for the OHL skaters, and gives each of them a little bit of leverage when dealing with friends from the other leagues. "We always actually kind of battle, us and the WHL guys, but we got the claim to fame right now so it's pretty good for the OHL, we're not complaining," said Alex Pietrangelo, selected No. 4 by St. Louis. Pietrangelo skated for the Niagara IceDogs in 2007-08, his second full season in the OHL. Traditionally the OHL is the league that produces the most NHL talent in any draft (since the modern-day draft's inception in 1969, a full 21.2 percent of all players taken honed their skills in the OHL). This year was no exception. The first four selections -- Steven Stamkos of Sarnia to the Lightning, Drew Doughty of Guelph to Los Angeles, Zach Bogosian of Peterborough to Atlanta and Pietrangelo to the Blues -- were all "O guys." Josh Bailey, who was selected at No. 9 by the New York Islanders, also took pride in the success of the OHL this season. But, to him, it was more about the camaraderie of the players he knew than about getting the one-up on the other two leagues. "Obviously, coming from the O, I have to say, yeah, but it's really good to see those guys, I mean you know a lot of them; whether it's the prospect game or just playing against them in our league and they're all really good guys and we're all really excited for each other to see each other go," Bailey said. Luke Schenn was the highest-rated WHL skater to be taken. He was selected fifth by the Toronto Maple Leafs, who moved up two slots in a trade with the Islanders. Goalie wars -- Thomas McCollum of the Guelph Storm was the No. 1-ranked North American goaltender by NHL Central Scouting Services and Chet Pickard of the Tri-City Americans was rated No. 2. However, they went in reverse order in the opening round of the Draft as Pickard was taken with the No. 18 pick by the Nashville Predators and McCollum went No. 30 to the Detroit Red Wings. McCollum looked like he thought it went perfectly as he tried on his Red Wings' sweater. He said he had a good conversation with the team at the recent Combine in Toronto. "I thought the meeting went really well and that I had the right answers to their questions," said McCollum, who ranked No. 4 among Ontario Hockey League goalies with a 2.50 goals-against average. McCollum went 25-17-3-3 with a .914 save percentage. He set the Storm record with five shutouts this season. "My coach at Guelph, Dave Barr, played for the Red Wings and I was hoping he was talking me up to them during the season. I'm a butterfly goalie and I use my size to fill the net. I've been told I'm a good skater and that I have good lateral movement." McCollum grew up in the Buffalo area and was a big fan of Dominik Hasek when he played for the Sabres. "I spent a lot of time in the house, trying to emulate the things that Hasek did," McCollum said. "So it's pretty interesting that I could get a chance to play in his old stomping grounds." McCollum said he knows it will take a lot of work to make it to the NHL, and that's what he's planning to do. "I just need to work, talk to my coaches, especially the goalie coach, and push myself to be the best I can be. I know it's going to take hard work. This is the best league there is." A "B" goes first -- Daultan Leveille surely was one of the most unheralded draft prospects entering the 2007-08 season. Leveille played for the St. Catherines Falcons of the Junior B Golden Horseshoe League, a circuit that rarely produces NHL talent. But Leveille had a breakout season, posting 29 goals and 56 points in 45 games, and with the No. 29 pick in the first round, the Atlanta Thrashers selected the 5-foot-11, 163-pound center. Leveille will take his game to Michigan State University next season, but he'll be in contact with his former teammates to let them know the NHL Entry Draft could be a reality for them, also. "I have some friends that their draft year is next year, and I know one two years from now who plays on my team, so I'll help give him some advice because he'll be a great player," Leveille said. Caps get what they wanted -- Washington General Manager George McPhee admits he generally doesn't get involved in a lot of the trade talk that takes place on the draft floor. But in the first round of the 2008 NHL Entry Draft, McPhee changed his strategy to get the players he wanted. McPhee Starting the night with the No. 23 overall choice, McPhee made a deal with New Jersey to move up two spots and take Swedish forward Anton Gustafsson. Later, he traded defenseman Steve Eminger to Philadelphia for the No. 27 pick, which he used to grab USHL defenseman John Carlson. "We felt, with respect to Gustafsson, we knew a team behind us was trying to move to get him so we got a little more aggressive to make sure we got the player we wanted," McPhee said. "Then we had talked earlier in the day that if he was somehow gone, we would have interest in John Carlson. We had been talking to Philadelphia for about a month about Eminger, and when it got to the point that they were going to do the 27th pick, we thought that's fair value for Steve and it would allow us to pick this kid up who could play in a couple years." McPhee's moves were two of the record 14 trades made in the first round. "The NHL is more about having a good team right now, more about the present than ever before," he said. "Everyone is trying to make sure their team is in good shape for this season and worry about the future later, it seems." What, me worry? -- Here's one that might surprise you. Reporters often agonize over the best question to ask subjects, but a simple question sometimes gets a revealing answer. New Jersey Devils GM Lou Lamoriello is the epitome of cool, usually standing motionless and wordless while taking in everything around him. From his team's championships, to his talented staff, to the great job he did in guiding the construction of the Prudential Center in Newark, Lamoriello exudes confidence and competence. It was a couple of hours before Friday's first round of the 2008 NHL Entry Draft at Scotiabank Place in Ottawa, when Lamoriello said hello to a reporter and extended his hand. During the conversation, Lamoriello was asked if he was nervous. "I wake up nervous and I'm nervous all day long," Lamoriello said. "I'm nervous before a draft and nervous before games. If you're not nervous, you're not paying attention." Detroit Red Wings' head coach Mike Babcock took part in a coaching clinic hosted by The NHL Coaches Association. Coaches come clean -- The NHL Coaches Association held a well-attended coaching clinic here Thursday that was well-received. You'd be surprised how open many NHL coaches were in revealing strategies that they use during games. Perhaps it's because the game is always evolving and what you did last season will be old news by next season. Besides, everyone studies videotape, so there are fewer strategic surprises during games than you might think. "Now I know how to beat Detroit," one coach said, laughing, as if innovative Red Wings' bench boss Mike Babcock will just stand in place and not keep searching for ways to attack and defend. "I couldn't believe how much Babcock revealed about his defense and I had to ask him why no one could overcome the triangle he set up around players carrying the puck into his defensive zone," said Mike Haviland, the coach of AHL Rockford Ice Hogs. "He was great and so confident in himself. You can see why he's a great coach." Florida Panthers assistant coach Mike Kitchen also saw great value in the clinic, but had an interesting take. "Sometimes, we overstress systems and strategies," Kitchen said. "This is a game that must be played with passion and commitment and we can't overlook our responsibility to players to strengthen them in those areas. "After all, the basic play in this game is to beat the other guy to the puck and do something useful with it or to take pucks away from attacking players. Having the puck and knowing what to do with it is the smartest strategy in hockey." Lots of Movement -- Calgary Flames GM Darryl Sutter was stunned by the rash of trades that went down Friday night, as several teams made more than one deal at Scotiabank Place. The Flames were one of those squads, as Sutter acquired center Michael Cammalleri from the Los Angeles Kings and the latter’s second-round pick on Saturday for the No. 17 pick Friday and the Flames' second-round pick in 2009. But his desire to have a first-round pick in the deep draft prompted Sutter to acquire the No. 25 selection from the Montreal Canadiens in exchange for forward Alex Tanguay and a second-round pick in 2009. Calgary also sent its fifth-round selection Saturday to the Habs. "That was a surprising first round," Sutter said. "I think it was probably because of the balance of the Draft. Once you get past the first couple of guys, there's a lot of interesting things. Teams are willing to move down, teams are willing to move up. It's an interesting Draft. I can't remember one where teams moved around that much." Family in the house -- Steven Stamkos, taken first overall by the Tampa Bay Lightning, had 71 friends and family members on hand Friday night at Scotiabank Place. But he wasn't the overall leader. Michael Del Zotto, taken 20th overall by the New York Rangers, was tops with more than 100 friends and family members in attendance. 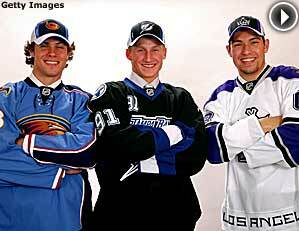 A Stinging endorsement -- Center Steven Stamkos was considered the best player in the 2008 NHL Entry Draft. What you might not know is that the Sarnia Sting has only produced four first-round picks through the years, and the highest previous pick was right winger Jeff Heerema, by Carolina, who was taken No. 11 in 1998. That same year, Phoenix picked goaltender Patrick DesRochers at No. 14. The other first-round picks by Sarnia are defensemen Jeff Brown (New York Rangers, No. 22, 1996) and Matt Pelech (Phoenix, No. 26, 2005). None of the four is currently in the NHL. Immediate Impact -- New Toronto Maple Leafs coach Ron Wilson seems inclined to give Luke Schenn, the defenseman the team took with the No. 5 pick, a chance to make the team this fall. Wilson thinks quite a few other teams may be thinking the same thing with their first-round picks. "It's possible, very possible but not common everywhere," Wilson said. "But the player has to be ready and mature. "As a coach, I didn't see these kids, but I've been told that the top 10 players may all be able to make it. Look at what Pat Kane did last year for Chicago, and Jonathan Toews, too. Toews might have been the better player if he hadn't been hurt. "I think it will be good if all the teams think that way (giving picks a chance to play right away), not just one team." Wilson was let go by San Jose on May 12 and signed with Toronto on June 10. His 518 victories rank him No. 3 among active NHL coaches.